I arrived at Yogi Bear's Jellystone Park Camp-Resort Monday, May 24th. Yup, that's right, anyone who knows me well knows that I'm a kid at heart, and when I stumbed upon this campground during my google search I had to go! 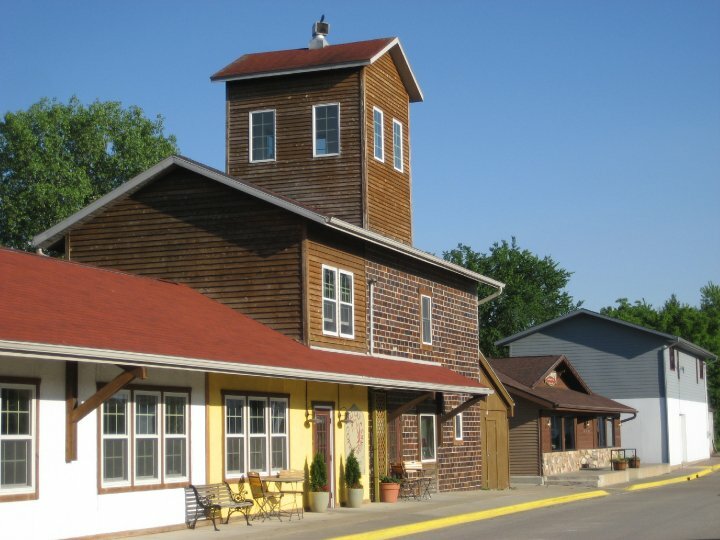 Turns out, Jellystone has locations all over the place, but this one I stayed at in Sturgeon Bay is the oldest - they celebrated their 40th anniversary last year! This place was quite enticing - general store, two heated pools plus kiddie pool, game machines and pool tables, goodie shop (pizza and ice cream), theater stage, playgrounds, tetherball, ping pong, arts and crafts, volleyball, miniature golf, horseshoes, funnelball, football, softball, shuffleboard, and soccer, PHEW! Yes, this all sounds fantastic and it certainly would have been had I not been the ONLY person on the entire campground! Yes I learned a lesson when I arrived that before Memorial Day weekend it is DESOLATE! I met my need for human contact speaking with Megan the staff person a few times, and she was nice enough to take a picture of me in the Yopi Bear cut out, lol. She said there was another person staying at the campground too, but I sure didn't see em. Anyway, I stayed there for a night and then I had to get out, LOL. After work at the Sturgeon Bay Public Library I drove up Hwy 42 into through some of the little towns that dot the map of Door County, but when I arrived in Fish Creek I knew I picked the right location to lay my hat for a few days. Fish Creek is a tiny little town where you can't get lost, because it's Main Street that has the cute little eateries, it's Main Steet that as the charming little shops, and it's Main Street that gets you where you want to go next. And these little shops and eateries make Main Steet one of my favorite streets, and Fish Creek one of my favorite places. I can't wait to go back with family or friends someday. It's the perfect get-away-from-it-all gem of a town. I arrived at Peninsula State Park - off of Main Street of course, lol - and walked through the charming blue door of the Park Office to find FOUR friendly Park staff happy to answer my endless questions about what site to take, what to see, and the most important question of em all - how far from my campsite are the restrooms, lol. Well right off the bat, right inside beautiful Peninsula State Park is 20 miles of bike trails (you can rent bikes at Nicolet Beach), Eagle Tower (offering a bird's eye view of the park and surrounding area from 75 feet off the ground - great views! ), a par-71 6200 yard golf course, a theater stage with musical folklore performances, 20 miles of hiking trails, nature center, Nicolet Beach (a natural sand swimming beach), and horseshoe island. Lots to see and do - and since the park is set on a peninsula, every drive to and from your campsite offers breathtaking views of Lake Michigan, and nearby islands. After setting up camp, I took a little evening stroll down quaint, quiet Main Street. The custard shop that lights up the sky, the stone Library/Post Office/Visitor Center, the two-story shop with blue paint and white trim, the yummy Wild Tomato pizza shop, the pubs, the little local gourmet market, and all the rest...this place has that little feeling of magic, of familiarity, that makes me feel at home away from home. Come Thursday and Friday this quiet town will be packed with visitors; this lovely little street with be filled with families enjoying their long Memorial Day weekend. And Fish Creek will be ready! I spent the day working at the village-like, stone-faced Library, which has to be the smallest library in the world, lol, but it serves it's purpose - for me, the purpose is Wi-Fi! The library is a little larger than a living room, and for the most part orders a book from the other county libraries when when a resident has a request. The library is in the same building as the Post Office and Visitor Center. At lunchtime I went down the street to Bayside Tavern for a burger - a veggie burger, yay! You know you're in a tourist town when the population is 200 and they offer a veggie burger, lol. Loved it, and the bartender was kind and entertaining his patrons. I think he owned the bar; I know he worked there for decades, and took a wonderful joy in his work. I hope to have a longer conversation with him the next time I'm in Fish Creek. Thanks to the camp staff, I visited Cave Point County Park, along with Whitefish Dunes State Park that's adjoined - and it was awesome! "Cave point is a popular site seeing stop for tourist who know the area well. It is known for its underwater caves and wave-worn limestone cliffs by fisherman, scuba divers, photographers and nature observers." And the white sand beaches, and beaches of sea shells...it was the perfect place for me to take a load off, take in the view, explore, and have my dinner (tuna, how appropriate!). I visited Cana Island U.S. Lighthouse this evening! It was totally your picturesque, ideal-looking lighthouse. Surrounded by Lake Michigan and lilac bushes (even next to the outhouses for a laundry-like scent while doing the deed, lol) it was a great spot to have my dinner. Today I set out for Washington Island and Rock Island - and had a blast! I arrived at the ferry around 8am. It was full by only two cars, so I along with the rest of us in line waited for the next one, and while doing so I got to talking with a local (he has a vacation place on Washington Island and has been coming here for years). He told me what to see and what was a waste of money, and while he scoffed at a couple of my ideas, he was saving me time and helping me out. I drive my car onto the ferry (the first time I've ever done this) and only 25-30 minutes later I was driving onto Washington Island. I drove half the perimeter and got out to explore as desired. I walked around Sand Dunes Beach, saw a couple beautiful sailboats being made on the Marina, and arrived at Jackson Harbor, where I stuffed my backpack and boarded a ferry to Rock Island State Park. It was small ferry and I happened to luck out be there for an unscheduled ride that allowed me to see more stuff today. As I approached Rock Island I was swept away by the views of the Viking Hall (built in the 20's) and the long sand beach peninsula, rising up just barely above the water. It's a primitive island off the tip of the Door County peninsula in Lake Michigan. 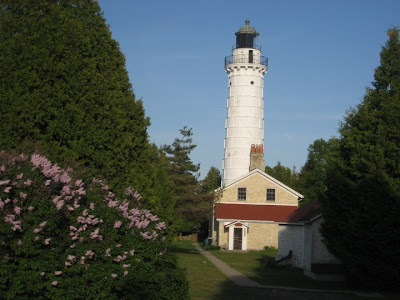 It features stone buildings (with his original Icelandic carved oak furniture, and exhibits of Indian artifacts that date back to 1678) built by a wealthy inventor who owned the island between 1910 and 1945, the Potawatomi Lighthouse (the oldest light in Wisconsin - 1836! ), stone water tower, site of a former fishing village, a half mile of beautiful sand dunes, 3 old cemeteries (two of which have marked stones), and rocky shoreline with rock carvings. I explored the island for a couple hours, snapped some photos, and upon departing Rock Island heading back to Washington Island I met Paul. I 25 year old guy who biked from Wassau, WI, quite a ways! We got to talking about our adventures, and we went out exploring for while when we got to back to Washington Island. We first grabbed something to eat at a little restaurant where a black lab growled and barked at us (yet wagged it's tail) when we entered. Gee, nice welcome! Then we went to Nelson's Hall for a real meal, where more than 10,000 people each year join the Bitter’s Club, by drinking a shot of bitters and receiving a membership card. Built in 1899, by Danish immigrant Tom Nelsen, The hall has served as a social center for Island residents and visitors. The custom of drinking Angostura Bitters as a stomach tonic was established at Nelsen’s Hall by Tom Nelsen. Throughout most of his 90 years, Tom drank nearly a pint a day. He credited his long and healthy life to this habit. Tom would be proud to know that today, because of him, Nelsen’s Hall is the single largest purveyor of Angostura Bitters in the world according to the Guiness Book of World Records. During prohibition, Tom applied for and was granted a pharmacist’s license and dispensed his stomach tonic to the local residents. Even though Angostura Bitters is 90 proof, Tom was allowed to serve his tonic, so his saloon remained open. This make Nelsen’s Hall the oldest legally continuous operated saloon in the state of Wisconsin. Next, Paul and I scoped out some great views of the area from the tower (lots of steps, lol) at Mountain Park, then lastly we checked out Schoolhouse beach. A rocky beach, but that didn't stop the campers from swimming there. The rocky shore is beautiful - the rocks are pure white, real pretty. I bid Paul farewell and stopped into The Red Cup (the local from the ferry recommended it) for a delicious peach smoothie. It really hit the spot! Then I took the ferry from Washington Island back to the mainland, making for a nice evening and sunset on the water. Fish Creek was bustling when I got back into town. The visitors were here for the weekend and taking a load off, strolling the shops and eateries along Main Street. I meandered all the little shops and checked out a fish boil - another Door County "thing." The meal consists of Lake Michigan or Lake Superior whitefish (though lake trout can be used), with other ingredients. The fish is typically caught by local fishermen, cut into small chunks and cooked in boiling water with red potatoes. Some boilers add onions as well. Salt is the only seasoning used. The cooking of the fish is an elaborate presentation. Restaurants typically ask that patrons arrive a half hour early to witness the boiling. The fish and potatoes are placed in a cast-iron kettle. When the water comes to a boil the potatoes, kept in a wire basket, are lowered in. The fish are then placed in another wire basket and lowered in. When the fish oils rise to the top of the pot, the boiler will add a small amount of kerosene to the flames. The whole kettle becomes engulfed in flames, which causes a boilover - you see the fish oils spill over the side of the pot, and the fish is done. After witnessing the Fish Boil I made my way down to The Wild Tomato pizza shop, where I might have comsumed the best pizza I've ever eaten. They use the best fresh, local ingredients and use sustainable products. I tried "the fun guy" pizza - 5 kinds of fresh mushrooms, cheese, red onion, it was incredible. I took down the tent, packed up my car, said my goodbyes to Peninsula State Park (which by the way, did I mention they have the best showers I've ever experienced in a campground?! The showers are are completely separate enclosed rooms with separate door/access to each one! And there's water pressure! In fact one of the showers almost took my head off!) and beloved Door County, and made my way to Wisconsin Dells. I left the campground early in the morning and made my way up to the charming little harbor town of Bayfield, WI, for my 3 hour cruise around the Apostle Islands. I approached the counter of the Apostle Islands Cruise Service, behind which stood the manager (of course she's the manager - she's also the clerk, the reservation taker, the operator, etc - it's a very small town!) sporting a crisp, white Sea Captain's uniform, lol. I love when places go all out! I thought she was so cute until she told me there had to be 16 people for the [real] captain to take the boat out - only 13 people had reservations, and of the 13 reservations, only THREE people had arrived - and that number included me! Anyway, I came back 15 minutes later (a few minutes before the boat was scheduled to depart the harbor) per her request, and thank goodness she said we were ready to go - almost everyone had arrived and payed and and 13 out of 16 people was good enough for them. Ahh, relief. Anywhoski, the islands, well...they were islands that looked just like islands usually do, lol. There are 22 islands that make up the whole lot, and when you've seen the first couple you've pretty much seen them all. They were different shapes and sizes of course, but all made up of the same vegetation, animal species, sandstone rock, etc. Now don't get me wrong - it was a beautiful, sunny day on Lake Superior, a relaxing boat ride with good captain/narrator, a very handsome captain's son, and of course the lush green islands. There are TWO islands that are special. Madeline Island is one. Of the islands, it's the only one that actually has year-round residents (a whopping 220 of them). It has its own restaurants, shops, etc. It's only a 20 minute ferry ride from the mainland. The other special island is the best one - the one they saved for last on the cruise tour: Devil's Island. Yeah, baby! 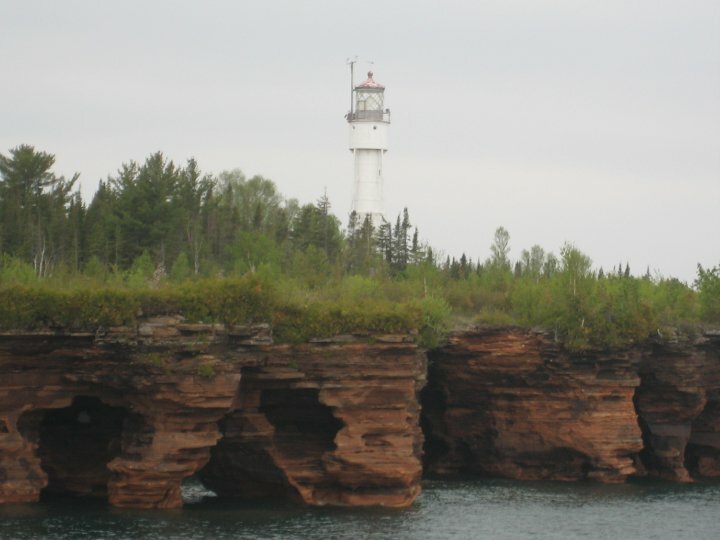 It's actually the northernmost point of land in Wisconsin, and rises about 60 feet above water level. What's cool about the island, other than its remoteness, are the sweet sea caves which undercut the shoreline. In some places, the red, sandstone cliffs on the northern half of the island look honey-combed (on a grand scale). After the cruise I headed down to High Cliff State Park in in Appleton, WI, where I stayed just for the night, and since it was late, the park office was closed, and the fees were way more than they quoted me on the phone, I just slept there that night and left real early in the morning. Not proud of not paying, but there were lots of spots and I figure I did no harm. High Cliff State Park by the way is beautiful! Lots of woods and shaded camp sites, and lots to do. They have a general store, a nice beach, and it's not too far from town - although getting into town is a maze with all the roundabouts! It's currently 12:15am, the night of Saturday May 22nd, 2010. This is the first day of my journey through the U.S. I am situated in my tent, maybe only 100 feet from Lake Superior. I got to my tent site at approximately 6:30pm today. I'm so lucky to have turned around and checked out this campsite (Washburn Memorial Park campground: http://www.cityofwashburn.org/parks.htm#morial) on my way to the more expensive one a ways down the road. It's only $15! I saved 7 dollars, which is a quite a bit, and every dollar counts - I need to be as frugal as comfortably possible :) I'll be tent camping as much as I can, and splurging on cheap motels when it's raining, etc. I shipped off from my dad's place today at around 2pm. Man, it sure took longer fitting my belongings into my vehicle this time! I did a test run before to make sure everything would fit. It'll get faster with each time I do it I suppose. Anyway, my route was I-35N to Duluth, then Hwy 2 E then Hwy 13 N up to the Bayfield area, so that I can experience the 3-hour cruise (http://www.apostleisland.com/) around the Apostle Islands (http://www.nps.gov/apis/historyculture/wonder.htm) tomorrow! 1. The DQ (Dairy Queen) in Washburn has the cleanest public restroom I've ever seen. Great, big deal - BUT - they furnished it with knick-knacks and tankcloths (tablecloths for the toilet tank). Have you ever been greeted by a hubble sitting on a red and white-cloth checkered toilet tank-staring, up at you with a big smile on his face? Was NOT expecting that. 2. Outhouse with a satellite dish - just standin' there in the middle of a field next to the interstate! 3. Bar with gas pumps. Have you ever after a long night of drinking gotten in your vehicle, only to realize the mo' fo' is out of gas? Don't let your intoxication fool you - those ARE gas pumps over there, and YES, they ARE functional. Go for it, you winner, you. "Twenty years from now you'll be more disappointed by the things that you didn't do than by the things you did do. So throw off the bowlines. Sail away from the safe harbor. Catch the trade winds in your sails. Explore. Dream. Discover." It's Midnight on Saturday May 22nd, 2010, I'm situated in my tent, just a hundred feet from the shore of Lake Superior. Today was the first day of my journey through the U.S., and well, my mom must be pretty peeved with Mark Twain right now, lol. It's not easy seeing your loved ones say their goodbyes and to feel their pain as they let go yet another time. And I am so incredibly lucky to have such amazing parents that support me and know that I should do this - even though it breaks their hearts, and even though they fear for my safety. I'll check in often, follow my instincts and won't let them down. Times flies, I'll be back in no time. - Lodging: Primariy tent camping; I will splurge on cheap motels when it's raining, etc. - Dining: Cheap, but nutritious. Breakfast may consist of a mineral-rich protein powder mixed beverage (don't worry, nothing crappy like Slim Fast!). Lunch will perhaps be $5 Subway footlong, with which I'll eat half for lunch, half for dinner. I'll splurge occasionally when the mood strikes. - Entertainment & Recreation: I'll be able to take the savings of cheap lodging/dining to endulge in all the states have to offer (tours, attractions, etc)! - Route: I'm heading out East first: Wisconsin, Illinois, Indiana, Michigan, Ohio, Pennsylvania...I can't wait to see my friend Kevin in Connecticut, yay! - Timeline: None. I'm taking this at my own pace; one state at a time. As I'm seeing one state I'll be coming up with a list of things to see in the next, so on and so forth. I'll be done when I'm done. - "1000 Places in the U.S. and Canada to see before you die." (By the way, do they really need to add the "before you die" part in there? I mean, c'mon. Thanks for the reminder. 1. Do you know someone fairly close to a city I've listed? Can they host me for a night or two? 2. Do you know a place/attraction/oddity in an upcoming state that I really shouldn't miss?